Liu X.-y., Huang H. & Zheng R.-y. (2007) Delimitation of Rhizopus varieties based on IGS rDNA sequences. Rhizopus currently comprises 10 species two of which, R. arrhizus and R. microsporus, are divided into nine varieties. The molecular phylogenetic relationships among varieties were studied here by using IGS rDNA sequences. All three varieties of R. arrhizus were characterized by special short tandem repeat (STR) motifs except for strain CBS 257.28. The phylogram of R. arrhizus consisted of four clades. Three clades comprised R. arrhizus var. arrhizus, R. arrhizus var. delemar and R. arrhizus var. tonkinensis, respectively. The fourth clade was composed of CBS 258.28 R. arrhizus var. arrhizus and CBS 257.28 R. arrhizus var. tonkinensis. However, the varieties of R. microsporus did not correspond with any STR motif or form monophyletic groups. According to this study, the morphological and molecular characters evolve in concert in R. arrhizus and at different rate in R. microsporus. 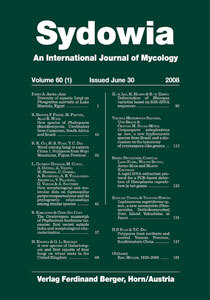 Keywords: classification, molecular phylogeny, Rhizopus arrhizus, Rhizopus microsporus, STR.